• Small areas of decay between teeth or below existing restorations. • Abscesses or cysts not on the mouth’s surface. Digital x-rays are comfortable for patients, and they are more convenient because they are faster than traditional x-rays, with images ready to be viewed on a computer or TV screen in seconds. Digital x-rays are also safe. Some studies cite that digital x-rays emit up to 90% less radiation, and they can even be used during pregnancy if absolutely necessary. Since no chemical processing is required for digital x-ray images, this is another way we try to do our part to be kind to the environment and our community. We recommend these x-rays on a yearly basis. 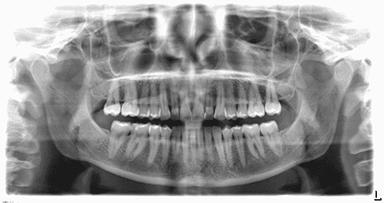 This is a 2-D x-ray that captures the entire mouth in a single image, including the teeth, upper & lower jaws and surrounding structures and tissues. 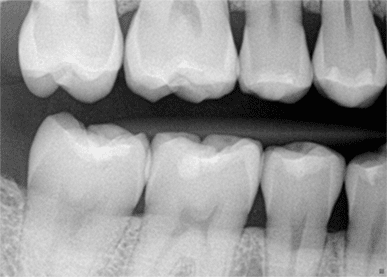 It is a diagnostic tool that can help see cysts and tumors, wisdom teeth, and other developmental abnormalities that we cannot detect from the digital x-rays. We recommend these kind of x-rays every 5 years.